Even rampant construction outside the school’s doors on Perkiomen Avenue could not stop this event! 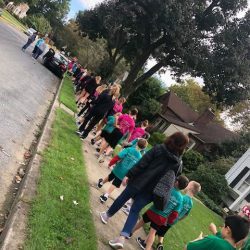 The school children carved out a new route for the annual event, walking around Antietam and Mount Penn with the help of volunteers and the Central Berks Police Department. And because it was National Do Something Nice Day – the students, faculty and staff decided to pay forward the generosity of corporate and individual donors by collecting gently used shoes for Soles4Souls, an international organization that provides both resources for and micro-enterprise opportunities for low income families around the world. As of the date of the Walk-A-Thon, over $20,000 had been raised for the school, and over 610 pairs of shoes were collected …. and counting! For more information about St. Catharine of Siena School, check out their website at www.scsreading.org and follow them on Facebook @SAINTCATHARINEOFSIENASCHOOL.